The HP PageWide Enterprise Colour Flow MFP-780dns is a multifunction printer with the capacity to print up to A3 size. It also has the ability to scan, copy and fax. It will work reliably in a medium-sized business that requires a high volume of printing and wishes to streamline and increase the security of this printing operations. Print quality is of a good professional standard, and operating costs are kept low. However, standard paper capacity is low, resulting in frequent printer downtime. You can purchase additional trays, but this will increase the price. 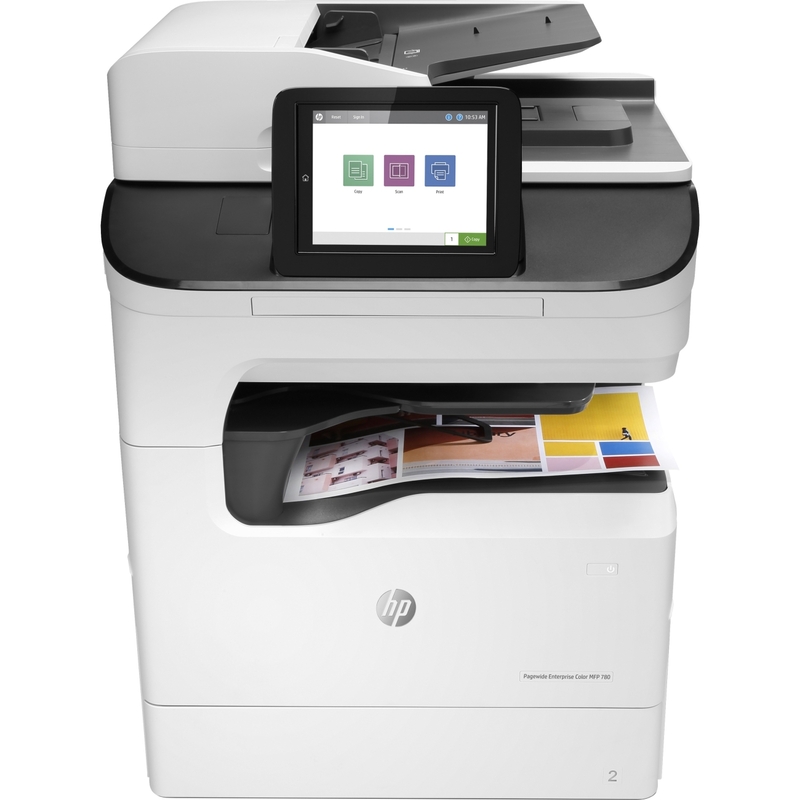 Measuring 813 x 591 x 458mm in a sleek black-and-white design, the HP PageWide Enterprise Colour Flow MFP-780dns will fit in with most workplace colour schemes. The printer is controlled using a 20.3cm colour touchscreen on the front of the device. Paper is stored in a 100-sheet multi-purpose tray and a 550-sheet paper tray, with the option to increase capacity if required. Connectivity to a computer is achieved via a USB or Ethernet and an optional wireless connection. Printing speeds are 45ppm, the resolution is 1200 x 1200 dpi, and the monthly duty cycle is 120,000 pages. The HP PageWide Enterprise Colour Flow MFP-780dns takes workplace security seriously with technology to detect and stop attacks thereby protecting sensitive information. With minimal maintenance, high-yield cartridges and duplex printing, it will increase workplace efficiency. It is energy efficient, keeping costs low for a multi-function printer and will also reduce your environmental impact. Paper capacity on the HP PageWide Enterprise Colour Flow MFP-780dns is low and may require frequent refills during periods of high-volume printing. You can increase capacity, but purchasing additional paper cassettes will increase the price. Wireless printing does not come as standard and will also increase the price if you require this connectivity option.